Extremely bright lantern that is powered by three super bright light modules. It uses radical COB (Chips on Board) technology which produces much more light intensity than conventional lights yet draws a lot less current which dramatically increases battery life. Multiple LED diode chips are bonded directly to a circuit board (which is usually yellow) to form an incredibly powerful light module. 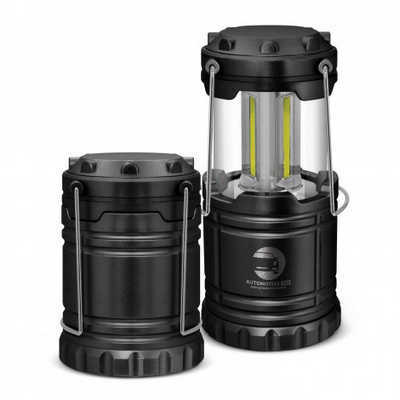 Simply pull the lantern open to operate and close to turn the light off. It has carry handles which fold away when not in use and it uses three AAA batteries which are included. Colours: Black. Dimension: Dia 85mm x H 125mm (closed). Print Description: 40mm circle (top). Print Type: Pad Print . Packing: Loose packed. Price includes : 1 Col 1 Pos Print. Setup is included.